Madge Ilene Gordon Dammann was born Nov. 9, 1924, to Jesse Noble Gordon and Bonnie Jean Wheeler Gordon in Sunnyslope, Chelan County, Washington, and died at the age of 93 on Dec. 8, 2017, at Aegis Assisted Living in Lynwood, Washington. 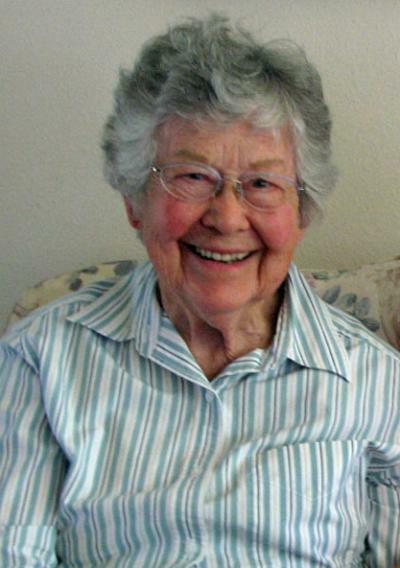 Her early years were spent attending church services at the Sunnyslope Church of the Brethren, hiking and exploring Birch Mountain, and sledding and skating in the winter with her family and friends. She was a skilled artist in her early years and many of her works have been handed down to family members. She played the violin, accompanied by her sister Kathryn on the piano, for many of her mother’s friends. Her love of music continued through her lifetime as she sang in church choirs, attended Seattle Symphony concerts and Broadway musicals. She married G. Woodrow Anderson on Nov. 27, 1941, and they moved to western Washington, settling in Normandy Park, where they built a home after World War II. They had four children, Leslie, Dennis, Peggy and Betty. They were married until 1958. Madge then went to work for Boeing at the Developmental Center in Kent, where she met Gilbert H. Dammann. Mr. Dammann was a Boeing transplant from Glencoe. His family still owns and operates a centennial farm in Plato. He graduated from the University of Minnesota in 1951. The couple chose to be married at Madge’s Bethel Lutheran Church among many family and friends on Sept. 7, 1963. In February 1964, the family moved with Boeing to Huntsville, Alabama where, a year later, daughter Shirlee was born. Following the family’s return to Washington in 1967, Madge furthered her education by attending Highline Community College, where she attained her Associate of Arts degree in early childhood education, and promptly started teaching at the community college preschool. Later, she taught at Our Savior’s Lutheran Church preschool. Throughout her life, she enjoyed a great variety of outdoor experiences. She was an avid hiker and tent camper, always had a boat and fished both fresh and salt water, water skied early, and learned snow skiing later. Part of her love of being outside was experienced in her garden and flowerbeds. She learned from her mother the love of raising beautiful plants and flowers, so wherever she lived it was a priority to immediately cultivate this future beauty. Her husband was often called upon to transplant this shrub from here to there (or back again). She always enjoyed having a garden in which to grow fruit trees, berries and vegetables. Early in life, especially during and after the war, it was necessary to grow a substantial part of the family foodstuff. Madge would spend considerable time canning fish, vegetables and fruits. There would always be a great selection of jams and jellies made from berries from the garden or picked by the children from the adjoining woods. The Dammanns traveled over the years to Alaska, Europe, Asia and almost every state in the U.S. They traveled light, with just a backpack. She was a very social person and they participated in a bridge group for over 40 years. She also sewed, carved wood, worked in stained glass, and quilted. She was preceded in death by her parents; brother, Clarence “Bud” Gordon; sister, Kathryn Rogers; and grandson, James Anderson. She is survived by her sister, Geraldine (Clegg) of Marina, California; spouse Gilbert H. Dammann of Lynnwood; children, Leslie (Sherri) Anderson of Kenmore, Dennis (Judy) Anderson of Puyallup, Peggy Miller of Hailey, Idaho, Betty Meilander of Ellensburg and Shirlee (Win) Lessley of Lynnwood; grandchildren, Mandy (Mike) Anderson, Chris (Dale) Anderson, Jason Anderson, Justin Anderson, Jessica (Wade) Bradley, Jennifer (Dave) Tozer, Nicolas Meilander, Winston Lessley IV, Marie Lessley, Robert Johnson and Chris Johnson; and four great-grandchildren, Ashtin Anderson, Marlowe Bradley, Rayna Johnson and Lukas Johnson. The family would like to thank the wonderful people at Aegis Assisted Living and the skilled care provided by doctors and nurses at Virginia Mason. Donations in memory of Madge can be made at Lutheran World Relief at lwr.org. A celebration of her life will be held Saturday, Dec. 29, at Light of the Cross at in Bothell, and she will be interred at Flora Hills Cemetery in Lynnwood. Please visit its website to leave messages for the family.